Wednesday 3rd January - non-specific club run / training opportunity at Cranford Community College from 18:00* Club Committee Meeting from 19:45 with any member welcome (but remember your sandwiches). New members and potential members of all fitness levels and abilities are welcome at all of these events. The full diary of club featured events is on the club website at: http://www.barunner.org.uk/Event Diary.shtml. The editor and all his staff hope that you all get what you hope for and deserve this coming year. And that you send in reports of your plans and achievements. We are currently looking at candidates for the BAAC 2017 Awards, including the Brian Forrester 10K trophy. Please could you send me your 10K performances during 2017, with any extra information about the event which could impress the judges . The 4th of my Round the Airport runs took place today, the route evolves each year but is mostly away from main roads and ends at a pub and is approx. 13 miles long. Ten of us set out although one other did run and missed the rendezvous. It was a really good group with two current BA employees and one ex BA and seven members of Shepperton Running Group plus one dog. All made it around and most had a quick beer at the end. There was a huge turnout at Bushy Park where the attendance of 1586 has only ever been topped by the 10th anniversary run in October 2014 (1705). Paul Knechtl (18:39) was the quickest of our large group on a day when the first 49 runners dipped under 19 minutes. Over at Tilgate, Adrian Haines was even faster finishing second in 18:26. Julie's modest (for her) time of 22:17 was because she was treating the event as a training run, including an extra four miles running home afterwards. Due to a barcode mis-scan Tim Bellars was initially left out of the results at Roundshaw Downs . It wasn't until the Elves woke up from their post Christmas-rush sleep that they attended to his email and added his result in. Simon Ashford found an un-run parkrun on his doorstep - Houghton Hall in Dunstable. 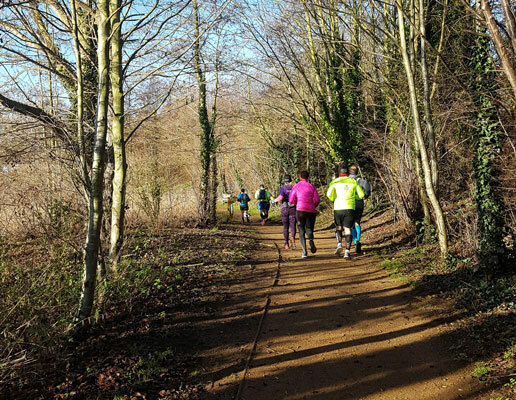 This parkrun had had their inaugural run cancelled due to the cold snap the other week so Simon ran at their second actual run to make this the club's 375th different parkrun run at. Others from the club will inevitably follow quickly. Kevin Holland ran his 50th Woking parkrun but will now take a long break from running whilst he recovers from an operation due in early January. We wish him a speedy recovery. Saturday also featured the 100,000th UK parkrun. Many different parkruns running simultaneously could claim to have been the 100,000th. Perhaps more significantly there are now 492 parkruns in the UK with more arriving soon - shortly then we'll have the 500th UK parkrun. Meanwhile Roderick failed to run a parkrun for the first time on a day in which he has attempted to - after 279 successes. He was in Oslo for the recently started Toyen parkrun but sadly sheet ice resulted in this parkrun's cancellation just after Roderick flew into the city. The next nearest parkrun was a four hour drive away in Sweden and given the freezing overnight conditions...not to mention the lack of a car...Roderick had a rare lie in. There were a number of notable doubles run this year, some I suspect long in the planning and satisfying in the execution. Roderick Hoffman (28:18, 29:33) started early at Castle Park (Bishops Stortford) with an unusually early start for England of 8.30 a.m. Having finished there by 9 a.m. he was able to travel through Essex, across the Thames at Dartford and on through Kent to Shorne Woods between Gravesend and Chatham for a 10.30 start. Castle Park was a new park for the club. At Shorne Woods Roderick took the club record off from Steve Newell. Richard Ruffell chose a pair in NE London rather closer together in time and distance and set a new club record of 19:39 at Wanstead Flats from a 9 a.m. start and followed with a 21:25 at Valentines Park just across the North Circular in Ilford from a 10 a.m. start. Two club records taken from Roderick. Jonathan Cox, Trish McCabe and Ian Cunningham all completed the classic Bushy Park/Crane Park combo although whether they also ran between the two I can’t say. A party of five from Bedfont Lakes headed for Hove Promenade including Anne Bannister (29:48), Bob Bannister (25:13), Caroline Cockram (25:47), Ian Cockram (24:43, new club record) and David Duggan (27:47). The Cockrams and David Duggan then headed for Brighton and Hove where Caroline Cockram set a female club record of 25:47. The male record is a bit of an anomaly and is held by Roderick Hoffman with 24:41 but only because Adrian Haines’ membership had lapsed when he ran his 17:27 there in 2012 [Ed: What counts is what is in the computer :-) ]. Adrian Haines (17:37, 83.73%) has started this year well with his best ever run at Tilgate which places him 2nd out of 594 in his age group. This was 15 seconds faster than his previous best, set in November 2014. Chris Kelly (23:08) overcame the hills and the mud at Henley (see below) to set a new club record (from John Scaife) before heading over to Woodley (21:10) for a more routine run there. Sarah Gordon had an interesting morning visiting two parks new to her in a part of Yorkshire littered with Rugby League clubs. Her first run (35:54) at Pontefract was followed by short journey to Nostell Priory near Wakefield. Nostell has been going for a while and most Saturdays gets about 200 runners with maybe double that on New Year’s Day. This time they were overwhelmed with over 700 and ran out of finish tokens. Worse was to follow as all times were lost. A nightmare start, but …. 700 people have a time of 59:59 and we can assume many will return to grab a pb sometime soon. There is always a silver lining if you look hard enough! [Ed: And my club record there is safe for another week!] Nostell's attendance was the third highest in the country after Bushy and Southampton. Of those doing two runs the most improved was Ian Cunningham who knocked 4 minutes off his Bushy time at Crane. Sarah, obviously, gets the most slowed and the most consistent was Ian Cockram with just a three second difference between the two runs. Small report of Julie Barclay’s first run in the Krakow 5k parkrun on New Year's day. Julie finished 27th (2nd lady) in 21.52 and Julie finished with the highest age grade of 80.64% out of the 105 that ran. A little interest, the 0/30 lady that finished 3rd just one second behind Julie and ran 21.53 but her PB is 21.51 So probably gave Julie a tough run but on the right day. Unfortunately Paul Watt who has been nursing a groin problem wisely decided not to risk further agro. so did not start. Had a helter-skelter run at Henley on New Year's Day. As previously mentioned by others it is a trail run, rather than a park run - which was emphasised at the briefing - lots of mud, ups, downs, barbed wire, tree roots and branches, narrow unpassable* sections, hairpin bends, so no dogs, no buggies allowed - all very Indiana Jones - mind you, nobody told us about the rocks that crash together across the track! So it was a definite opportunity for the Inov-8 mudclaws, in a bid to stay vertical. A little bit of out and back at the top of the hill gave a chance to see how many were ahead of me, and ealising I was in the top ten for the first time for a while... spurred me on for the second lap. I lost ground on the climb, but clawed it back on the drop to finish very pleased in 8th, of 81, in 23:08. Ed: Unpassable should be a real word - the difference from impassible is clear. I CAN'T EMPHASIZE ENOUGH THAT LATE ENTRIES WILL NOT BE ACCEPTED - the World indoor championships open in Birmingham the day after the entries close, neither myself nor any of the organising team will be left around in London to sort queries, it will be to everyone's advantage if you enter as early as possible. Let Steve Hillier know if you are interested in this.